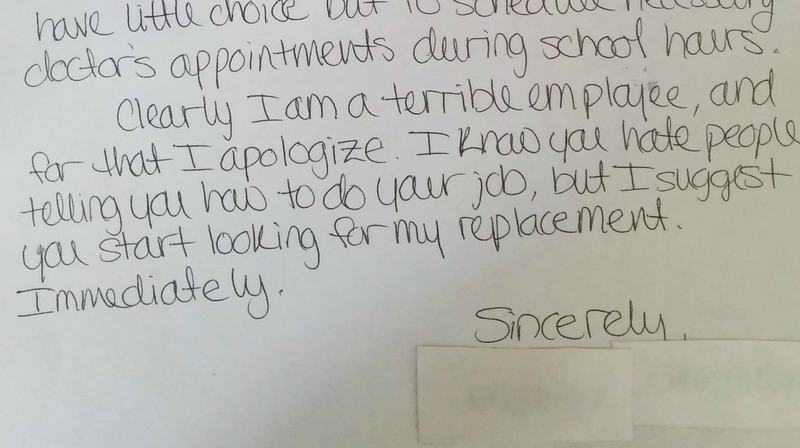 This resignation letter, anonymously posted to Reddit, is going viral for its sheer sarcasm and because it paints a picture of a nightmare employer that just about everyone can relate to. The resignation letter doesn’t identify anyone involved, but it’s easy to pick up on why this person is at the end of their rope and ready to go out in a blaze of glory. Sounds like a pretty reasonable excuse for an absence, no? 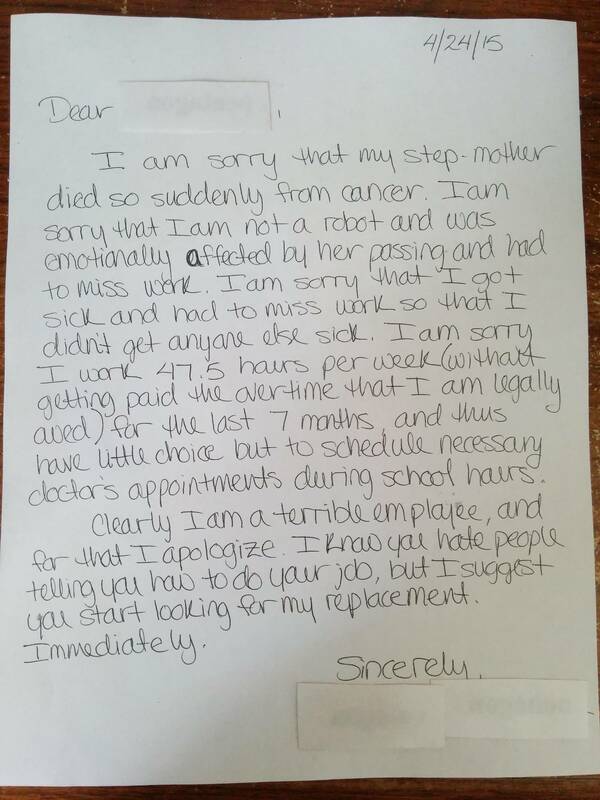 “I am sorry that I got sick and had to miss work so that I didn’t get anyone else sick,” it goes on to say. Dripping sarcasm aside, these are real issues American workers face every day. The number of workers in the U.S. who belong to a union to protect their rights and negotiate conditions on their behalf has fallen by half over the past 30 years. American workers are earning less, working harder and have fewer protections than they have had in a lifetime, all while executive compensations balloon to gargantuan proportions. A staggering quarter of public workers in America — about 26 million Americans — don’t get paid time off. Stepmother dies? Tough tacos. Four out of 10 private sector workers — nearly half the workforce — don’t get paid time off for being sick. That’s 40 million people who should be keeping their germs and sick selves at home, drinking OJ, and instead are schlepping through the day, spreading their illness, because they rely on the paycheck. And so it seems our snarky, unemployed friend who wrote the letter is likely in good company. The author of the rage quit letter is taking some heat in the Reddit comments for being unprofessional and for the passive-aggressive tone, but sometimes when you just get fed up enough, you gotta make a big exit. Might not use this employer as a reference for your next job, though.